The Restaurant “The End Beach” is located at south Koh Chang on the last public Beach in this direction. The location is fantastic: hammock’s, bamboo chairs under the tropical sun next to the warm Gulf of Thailand. The tables of the Restaurant are under Coco’s Palms with view on Bang Bao Bay and the pier with the lighthouse in the end. 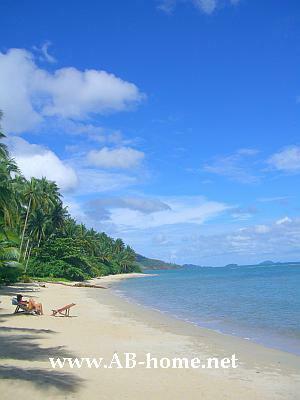 The Beach at Bang Bao is a nice option for day trips on the Asian Island Koh Chang in old Siam for Tourists on Holidays and Backpacker on Travel Tours who want to see a paradise Beach. Next to The End Beach Restaurant is a Massage studio where you can relax by a Oil or Thai Massage during you listen to the sound of the sea. The best way to reach The End Beach in Bang Bao on Ko Chang is by Motorbike or Taxi. For Taxi service you need to call or take a walk to Bang Bao Pier which is about 1,5 kilometers away. Next to the pier are mostly free taxis who go to nearly every Destination on the Island in Thailand. My favorite here at The End are the fried rice and of course the fresh fruit shakes which are perfect on a hot day surrounded of a tropical paradise Beach with the turquoise blue Gulf and the Hot South East Asian Sun. Here at Bang Bao Holiday dreams become true. Check it out, you don’t will forget this day on Koh Chang in Thailand.